Astronomers from the Niels Bohr Institute have participated in the first discovery of a planet the size of Earth. Using the NASA Kepler satellite, astronomers have observed a solar system with five planets, two of which are rocky. One is smaller than Earth, while the other is the size of the Earth. The results are published in the scientific journal, Nature. “It is a very exciting discovery which has been designated Kepler-20. 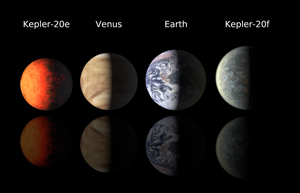 Kepler-20 consists of five planets orbiting a Sun-like star. Three of the planets are gas planets, slightly smaller than Neptune and the other two are rocky planets, one of which is 0.87 times the Earth’s radius, that is to say, slightly smaller than Venus and a little larger than Mars. The other solid planet is the size of Earth (1.03 times the Earth’s radius), and it is the first time we have found a rocky planet exactly the same size as the Earth,” explains Lars A. Buchhave, an astrophysicist at the Niels Bohr Institute and the Centre for Star and Planet Formation at the University of Copenhagen. The two rocky planets orbit close to their parent star. If the planet the size of Earth, called Kepler-20f, was formed in the outer zone of its solar system, where water was present, and then migrated closer inwards towards the star, it could possibly have preserved the water, which could be retained for several billion years in its current position, explains Lars A. Buchhave. But its location close to the star means that the surface temperature of the planet is around 430 degrees C, so it would not be in liquid form. But it may have a thick vapour, which ‘protects’ the surface, so the planet does not lose its atmosphere. Kepler-20 is about 1,000 light-years from the Earth, which is in our own ‘cosmic backyard’ for an astronomer. Planets outside our solar system are called exoplanets. 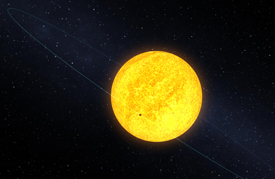 Observations of exoplanets with the Kepler satellite are made by measurements of the brightness of a star. When a planet moves in front of the star there is a little dip in the brightness. If this little dip in the brightness occurs regularly, there may be a planet orbiting the star, dimming its light. Lars A. Buchhave has helped to determine the radii and temperatures of the planets. The size of a planet is determined from the size of the star and the dip in brightness caused by the planet as it moves in front of the star. The Earth-sized planet has an orbital period of 19 days, so its ‘year’ is only 19 days long. Even though it is a rocky planet and possibly has water, it is not likely to have life, as it is extremely hot. So the planet is not in the habitable zone. “But we are getting very close,” says Lars A. Buchhave, who explains that things are moving very fast right now. “With Kepler we can measure with extremely high precision and this means that we can find these planets like never before. In total, more than 2,500 potential exoplanets have been found, which have yet to be verified. It is a very important stepping stone to finding an Earth-sized planet in a habitable zone and with it the possibility of life.